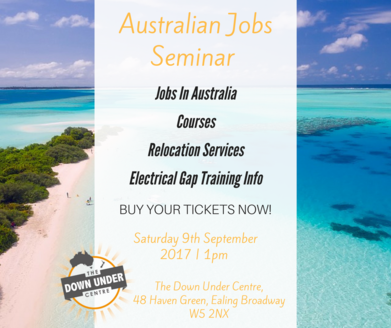 Date 16.08.2017 At The Down Under Centre, we’re hearing of new jobs for tradies everyday in Australia and New Zealand. A number of job opportunities are available for skilled workers in Australia. If you’d like to take the chance to grab an employment opportunity in Australia, you can apply to many jobs for your industry by visiting our jobs page! Bricklayers Cabinetmakers Carpenters Electricians Fabricators Plasterers Welders Project Managers Wall and Floor Tilers Motor Mechanics Technicians Teachers Nurses and more! We’re holding a seminar focused purely on the current Australian jobs we have going at the moment. We’ll be joined by some of Australia top employers as well as our expert partners who will be able to assist you in additional stages of your migration journey. Why not have a chat with a migration agent from Ian Harrop and Associates who can talk through your opportunities in Australia. This might be a good chance to find out if you’re eligible for a visa so make sure you come down! Buy your tickets for the event here. If you’re keen on moving to Australia and want to apply to jobs, please apply through our website today! Are you a tradie looking to get your Skills Assessment? We specialise in delivering the Trades Skills Assessment here at the Down Under Centre for your move to Australia! Speak to our Skills Team to discuss the process and fees for our Trades Skills Assessment at www.downundercentre.com/australian-skills-assessment. Have a free eligibility assessment with one of our team at the Australian jobs seminar! We also deliver the online White Card course needed for anyone in the construction and engineering industry, and the First Aid Course. You can find out more at www.downundercentre.com/courses.